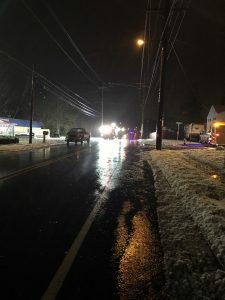 On Thursday, November 15, 2018 at 1815 hours members of the Mantua Township Fire District responded to the area of Lambs Road and Spruce Street for a motor vehicle crash. 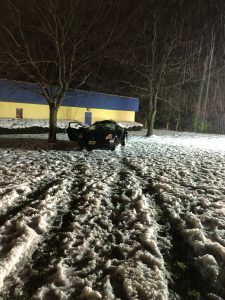 The incident was initially dispatched to Pitman Fire Department; however, due to the likely hood of the incident bein in Mantua Township, Squad Company 2211 responded. Chief 2201 arrived on scene to find a vehicle on the front lawn of 536 Lambs Road with the driver trapped. The second vehicle was found still on Lambs Road with the operator uninjured. Responding units were advised to go into service immediately upon arrival; however, EMTs on scene advised that the operator was deceased. At that time, the scene was turned over to Mantua Township Police for investigation. Squad Company 2211 remained on scene for approximately 3 hours assisting police with their investigation. At the completion of the investigation, the crew carefully removed the deceased male from the vehicle and assisted the Gloucester County Medical Examiners Office with extraction. The company was then released by Mantua Township Police. The incident remains under investigation by the Mantua Township Police Department. Anyone having any information regarding the crash are urged to reach out to the investigating officers. No further action taken. Units on location: Chief 2201, Squad Companies 2211 and 2818 as well as Engine Company 2832.